When we compare a loan using a normal amortization schedule (amortization book or calculation on an online website) we do not reach the same number of payments in Margill as in the on-line calculator. Why is this? Origination Date: July 14, 2017. Deferred interest and payments until Feb. 15 2018. 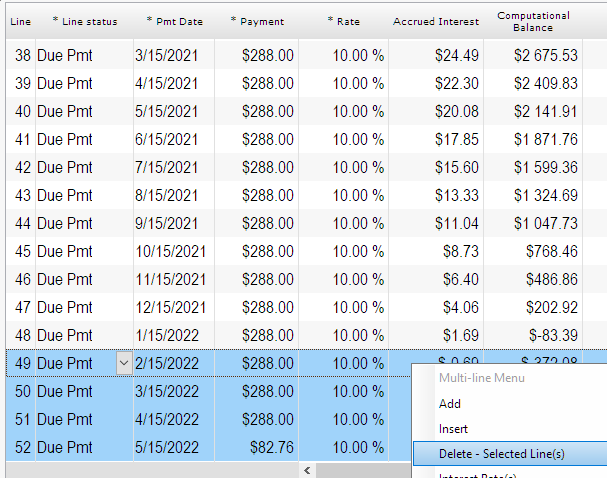 Normal amortization tables show payment of approx. $288.00 @ 48 months. Margill is showing us 51 + payments @ $288.00. Amortization tables (static) and on-line calculators cannot include deferred payments. They are usually exactly one period (often one month) after the Origination date. You could not thus get the proper payment with a 7 month deferral. If I do a 48-month loan, with first payment exactly one month after July 14, I thus get the $288 you are looking for ($288.86 to be precise). Leave the payment blank so it is calculated. So this is not what you are looking for since my first payment date is not properly deferred. Let’s say we really do want 48 payments with the February date. 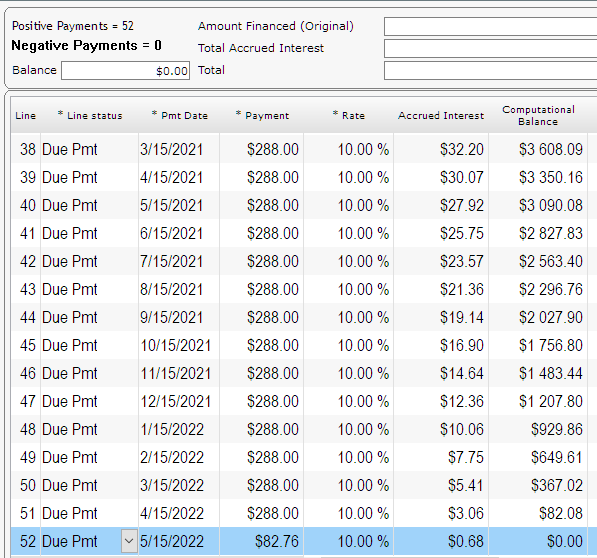 Because of the deferred first payment (6 months after a normal 1 month deferral) I am now at a payment of 303.81. Much higher since more interest accrued before any principal gets repaid. So I leave the the Amortization and Term blank and the number of payments will be computed to 52 with a last payment of $82.76. When I wrote “Deferred interest and payments” I meant thee is no interest from July 2017 to February 2018. You can simply change the Rate column to 0.00%. Balance then becomes minus $1047.44. Then delete the extra lines (for which the balance is now negative) by highlighting them > right click with the mouse. We are now at 47 payments of $288.00 and the last one at $204.61 (since no interest for 7 months).